Immunoassays are diagnostic laboratory procedures performed to determine the concentration of several biomolecules that aid in the diagnosis of several disorders. 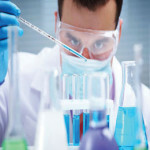 In addition, these assays are used to assess the efficacy of the drugs and to identify the drugs of abuse. The basic principles of immunoassays forms the antigen-antibody interactions in various test samples and are highly sensitive in nature. These assays are carried out across various fields such as biopharmaceuticals, environmental and clinical testing and in various settings such as hospitals, research and development facilities and clinical laboratories. Owing to the increasing demand for efficient assays that are highly sensitive and reliable, there has been a continuous evolution of these assays to ensure improved performance. This in turn leads to the continuous technical upgradation in immunoassay platforms or assays. Factors such as rising incidences of infectious diseases coupled with persistent product modifications contribute towards the market growth. In addition, increasing incidences of endocrine disorders (diabetes, thyroid dysfunction), enhanced discovery of biomarkers (cancer and cardiovascular) and introduction of novel drugs leading to increased therapeutic drug monitoring will further augment the market growth. 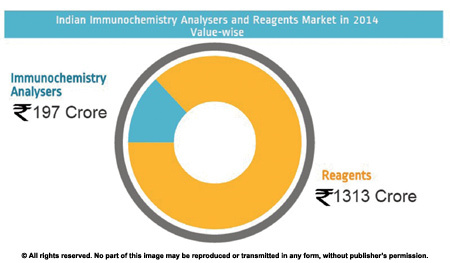 In 2014, the Indian immunochemistry analysers and reagents market is valued at `1510 crore. The highest contribution to the revenues is from the immunochemistry reagents, accounting for `1313 crore. The product segment is further categorized into six major immunoassay instruments namely chemiluminescence immunoassay (CLIA) analyzers, immuno fluorescence (IFA) analyzers, enzyme immunoassay (EIA) analyzers, radioimmunoassay (RIA) analyzers, enzyme linked fluorescent assay (ELFA) systems and multiplexed assay systems. 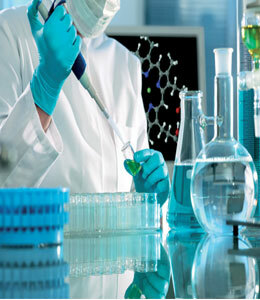 These instruments are classified on the basis of immunochemical methods used for detection and measurement. For instance, RIA analyzers involve the use of radioisotopes while IFA analyzers use fluorescent substances. 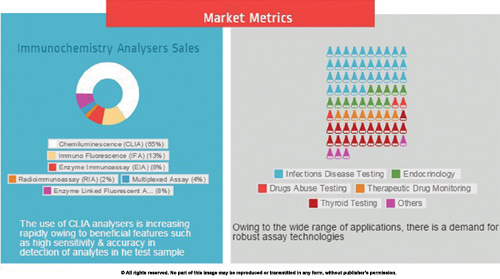 The immunoassay instruments market is witnessing a rapid pace of technological innovation coupled with diverse applications due to increasing demand for novel assay platforms with enhanced capabilities. The use of CLIA analyzers is increasing rapidly owing to beneficial features such as high sensitivity and accuracy in detection of analytes in the test sample. These instruments accounted for largest percent share (27%) of the global market in the year 2013 and are expected to grow rapidly in the forthcoming years. In addition, ELFA systems and IFA systems constitute the other promising immunoassay platforms. Immunochemistry instruments find varied applications such as in endocrinology, oncology, cardiology, therapeutic drug monitoring, infectious disease testing and drugs of abuse testing. Owing to the wide range of applications, there is a demand for robust assay technologies thereby generating a lucrative growth potential for development and commercialization of immunoassay instruments. The market growth is significant due to the high demand for automation of procedures in laboratories and diagnostic centres. Automation is already in place in the laboratories of developed nations, but is in high demand in India. However, the cost of automated random access analyzers is still high for Indian market. The shift towards lifestyle diseases, increasing demand for non-invasive diagnostic tools, identification of novel biomarkers and advent of new parameters like vitamin D, B12, cancer diagnosisare opening new vistas for the immunochemistry industry. Moreover, increasing healthcare spending and government initiatives will propel the immunoassay market. Vendors are continually expanding their product lines to fit varying end-user needs. For example, manufacturers are developing analyzers to meet end-user budgets, test volumes, desired breadth of test panels, and levels of automation. Additionally, many analyzers are modular for expansion as desired. Facing a high degree of competition, manufacturers are also shortening product cycles with new launches or adding value on existing installs. The future looks bright for immunochemistry industry, with intense research and development activity currently being carried out by small and major companies, and over 500 products are in the development pipeline. However, the immunochemistry diagnostic market will face increasing competition from other diagnostic technologies and so, future growth will depend on the availability of more clinical evidence to prove effectiveness of immunochemistry tests. The increasing competition from other technologies will also require market participants to differentiate their products to remain competitive. The immunochemistry market, which includes revenues from the sales of analysers, reagents, and automation for standalone immunoassay and clinical chemistry analyzers, as well as integrated immunochemistry analyzers, represents 40 percent of the global IVD market. In 2014, sales are expected to reach US$ 21.25 billion, based on estimated 7 percent CAGR. In terms of technology trends, the market is increasingly seeing the entry of chemiluminescence immunoassay (CLIA) analyzers, which are replacing older versions. Smaller labs still opt for immuno fluorescence (IFA) analyzers or semi-automated CLIA systems. Enzyme-linked immunosorbent assay (ELISA) systems and open systems are exhibiting some growth because of their open platform capabilities and larger test menu and affordability. IFA and CLIA analyzers tend to be more expensive, which works in favor of ELISA systems. Frost & Sullivan, however, estimates that ELISA systems will eventually experience erosion because of their lack of sensitivity and low specificities, especially as most laboratories are now consolidating and converting to high throughput systems. As a result, many vendors are using this opportunity to offer immunoassay or standalone clinical chemistry systems for a high discounted price. Demand for immunochemistry systems seems to work negatively for vendors. Because of this, the retention of the install base is crucial. Some strategies adopted by vendors include offering large discounts/upgrades, adding automation capabilities to existing modules, and having long reagent rental contracts. Frost & Sullivanâ€™s install base analysis reveals that a few open system platforms are declining in their install base, leading to rapid transition to either an IFA or a CLIA analyzers. According to College of American Pathologists (CAP) product data, an estimated 184,136 immunochemistry analysers were installed globally in 2013, and recurring consumable sales are a strong factor to segment growth. Only about 17 percent of these analyzers are installed in the United States, confirming rapid adoption patterns inÂ emerging and rest of the world countries like China, India, and Japan, where there is an untapped opportunity in rural and hospital markets that lack basic diagnostic laboratory infrastructure. 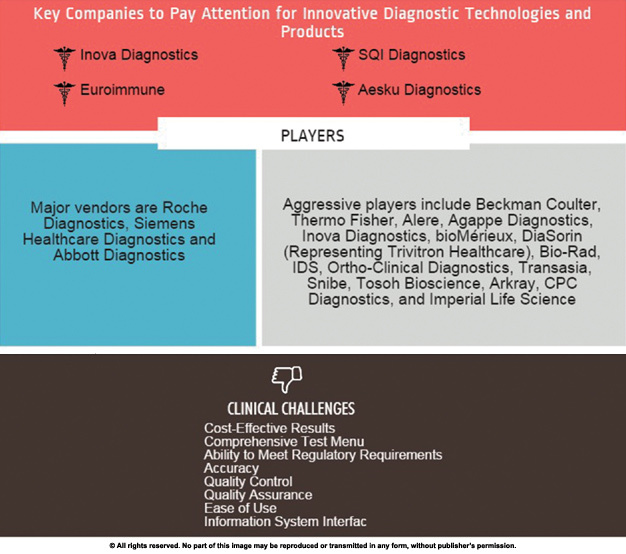 Major vendors are Roche Diagnostics, Siemens Healthcare Diagnostics, and Abbott Diagnostics. Other aggressive players include Beckman Coulter, Thermo Fisher, Alere, Agappe Diagnostics, Inova Diagnostics, bioMÃ©rieux, DiaSorin (Representing Trivitron Healthcare), Bio-Rad, IDS, Ortho-Clinical Diagnostics, Transasia, Snibe, Tosoh Bioscience, Arkray, CPC Diagnostics, and Imperial Life Science. The market is also seeing the influx of many newer companies from Canada, Japan, China and Europe. 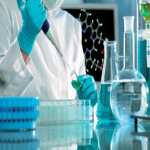 The market has undergone a massive change from a handful of participants offering only ELISA, CLIA, radioimmunoassay (RIA), and IFA as well as multiparametric assays such as microarrays, flow cytometry-based platforms, recombinant immunoassays, and indirect immunofluorescence assays (IFA). One of the key challenges when building on install base is the high cost associated with transition. Even when dissatisfied, most lab managers endure outdated instruments to avoid resource-intensive issues, such as the purchase process, staff retraining, protocol standardization, and data management system reuation. As labs consolidate, the immunochemistry analyzer market relies on instrument replacements to generate the needed revenue. Nearly all manufacturers rely on key strategies, such as offering replacements for old clinical chemistry and immunochemistry systems or acquiring clients from other vendors. Competition is stiffening as most vendors face difficulties increasing their customer base. The future will see CLIA as a growing analyzer segment with tremendous focus on areas, such as infectious disease testing and autoimmune and oncology segments. The market is moving toward multi-parametric assays, and many companies are exploring the use of multiplex technologies using protein and peptide arrays for autoimmune diagnostics.